Many in the international community, from Italy to the Czech Republic, who now call Berlin home, cite “Wir Kinder vom Bahnhof Zoo“ (Zoo Station. A Memoir) as a book – and film – that decisively shaped their perception of the city. When it was first published in 1978, Christiane Felscherinow’s warts and all description of her life as a teenage heroin addict and prostitute in mid 70s West Berlin was unprecedented. After the initial shock, many parents gave the book to their children (this author included) as a cautionary tale against drugs. “Wir Kinder vom Bahnhof Zoo” also reinforced the image of highrises as breeding grounds of social dysfunction (Christiane and her single mother had moved from Hamburg to the Gropiusstadt housing project in the Neukölln district). “Wir Kinder vom Bahnhof Zoo” became West Germany’s best-selling postwar non fiction book and has since been published in 18 countries. It came as no surprise that an enterprising film producer like Bernd Eichinger would snap up the rights. Directed by Uli Edel, the adaptation became a huge international hit – and inadvertently promoted the “heroin chic” aesthetic. Eternally entwined with the Christiane F. mythology is the music of David Bowie. In the mid-1970s, when the events of the book unfolded, the music Bowie released on his albums “Young Americans” and “Station to Station” was at its most glamorously alienated – robotic funk, chilly Philly soul and the beginnings of Bowie’s electronic experimentation. It captured the imaginations of countless teens like Christiane F. Bowie is referenced on several occasions throughout the book. In attempt to win her favor, the new boyfriend of Christiane’s mother gave the girl the “Changesonebowie” greatest hits compilation… which she already had. On an unhappier note, after a Bowie concert at the now demolished Deutschlandhalle venue, Christiane took heroin for the first time in 1976. When bringing the book to the screen, Edel (who replaced Roland Klick shortly before shooting began) and Eichinger sought Bowie’s involvement. He gave permission to use an album’s worth of his songs for the soundtrack which interestingly focused (with the exception of “Station to Station”) on work Bowie made while living in Berlin (to ostensibly kick his cocaine habit) between 1977 and 1979, after the time when the film takes place. Although “Heroes” hadn’t been released when Christiane and her friends were hitting the discos, the film montage sequence in the Ku’damm Eck shopping mall set to Bowie’s special version with German lyrics (“dann sind wir Helden, für einen Tag”) has become an iconic image of late Cold War West Berlin. Even the fateful Bowie concert is recreated, with a performance at New York’s Hurrah club (at the time Bowie was starring in “The Elephant Man” on Broadway and unable to travel) intercut with footage of fans at an AC/DC concert at the Deutschlandhalle. Christiane’s admiration of Bowie’s experimentation likely continued to influence her, as her teenage interest in rock led to her own musical endeavors. She became involved with the postpunk/new wave scenes in Berlin and Hamburg, working with future Einstürzende Neubauten members Alexander Hacke and FM Einheit. She released solo and collaborative records (with Hacke) that were recognized beyond her Zoo Station notoriety and starred in the dystopian and oddly prescient sonic mind control thriller “Decoder” (also featuring William Burroughs and Genesis P-Orridge), now a minor cult classic. Despite talent and hanging out with one of the most influential crowds in underground culture, sadly, Christiane’s music and acting career never took off. In 2013 she returned to the public eye in a big way after decades of relapse and rehab cycles with a second book, “Christiane F. – Mein zweites Leben” (Christiane F. – My Second Life). Through her website she recently announced her retirement due to chronic illness. Christiane Felscherinow brought a major social problem into the open, and her honest depiction of her ongoing addiction issues encourages us to examine the allure of dangerous substances that is manifest in our culture. And her story, for better or worse, will forever be one layer of the Berlin mystique that echoes far beyond the city limits. In cooperation with Exberliner magazine and Lichtblick Kino, this month’s Exblicks Berlin film screening is devoted to Bowie in Berlin. 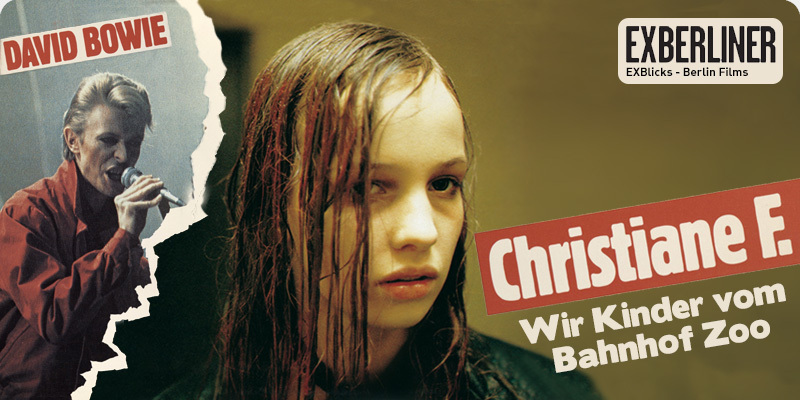 CHRISTIANE F. is showing on June 1 at 8:30 p.m. (with English subtitles), preceded by the documentary “Bowie in Berlin 1976 – 1979” at 6:00 p.m. The evening ends with a retrospective of Bowie’s music videos at 10:30 p.m., presented in cooperation with the short film festival Interfilm.